A seam brings two or more pieces of fabric together as a basic construction detail when you are sewing. A seam is the main ingredient in almost all sewing projects. Your first step will be to pin the seam you are going to sew. 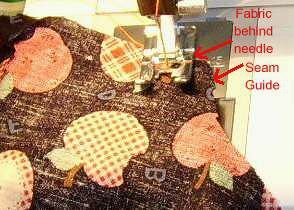 Before you start to sew your seam, sew a scrap of the fabric you are sewing to test your sewing machine set up. Your stitches should be even and balanced on the top and bottom of the fabric. You may have to adjust the sewing machine tension to obtain the best results. Refer to your sewing machine manual if the stitches are puckered or the stitching does not appear correct. Adjusting the ​stitch length may also help with many fabrics. Set a seam guide for the seam allowance called for in your pattern directions. Place the end of the seam under the presser foot of your sewing machine, leaving enough fabric behind the needle for a few stitches. Line up the raw edge of the seam allowance with your seam guide. Stitch in reverse to the end of the fabric. This is back stitching which locks the stitches, preventing them from coming loose. If your fabric is very lightweight or sees through, so the seam stitching would cause bulk or be unsightly, lock stitch rather than back stitch for a more pleasing appearance. Sew forward, sewing over the stitching that you sewed in reverse if you did reverse stitching, keeping the raw edge of the seam allowance at your seam guide. Keep the edge of the seam allowance lined up with your seam guide seam guide to maintaining a consistent and accurate seam allowance. A straight seam is the easiest seam to learn control of the sewing machine. Concentrate on watching the fabric at the seam guide, not the needle. Keep the fabric lined up with the edge of the seam guide as you sew. A perfectly straight seam will be the result if you watch the guide and keep the fabric straight to the guide. Sewing a curved seam requires you to know the exact point of the seam guide that is even with the sewing needle. Setting Your Seam Guide explains how to find this mark. A curved seam requires you to have control of the fabric as it feeds under the presser foot. As you sew the curve keep the edge of the seam allowance lined up with the mark that is even with the machine needle. Sew slowly and allow yourself the time to control the fabric. At the end of the seam, sew to the end of the fabric and sew in reverse for a few stitches, sewing directly over the stitching that reached the end of the fabric. This will be reverse stitching. Just as when you started the seam, if the fabric is very lightweight or see-through, sew a lock stitch instead of backstitching. Raise the presser foot and remove the fabric from the machine. Trim your threads and remove the straight pins. Follow the pattern directions to press the seam open or press it to one side.